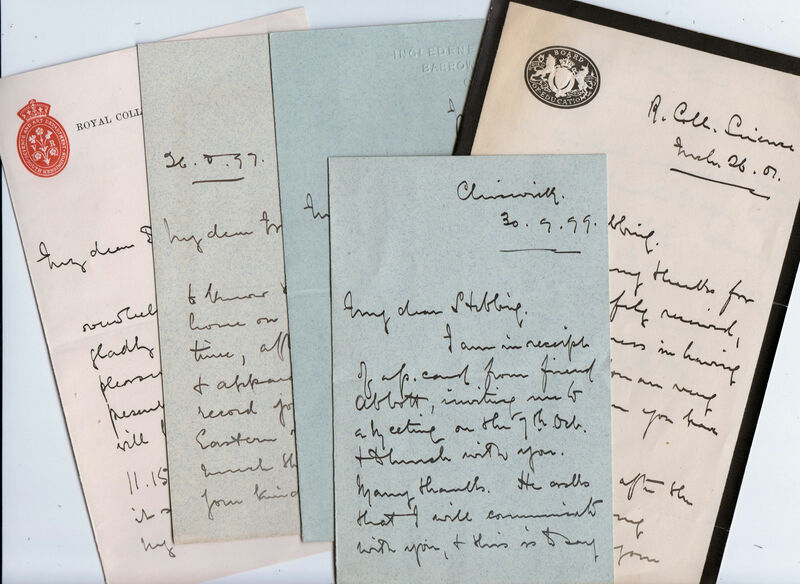 A series of 5 Autograph Letters Signed, to the Revd. Thomas and Mrs. Stebbing, discussing Club meetings, the Congress, travel arrangements, meetings, reunions, thanks for the “Ostracod safely arrived …you are welcome to the one your have retained”. 5 letters, 13 pp. in good condition. Together with an autograph postcard, also a letter from Anne Howes reporting her husband’s death, asking Stebbing to take the service. Royal College of Science and elsewhere, 1897-1901. Thomas George Bond Howes, FRS (1853-1905), zoologist. After being introduced to Thomas Huxley in 1874, his skill as a draughtsman and enthusiasm as a naturalist led to his being employed as assistant to Huxley. He was tasked with developing a system of practical instruction in biology at the Normal School of Science and the Royal School of Mines at Kensington, where he was appointed demonstrator of biology in 1880. Howes’s main interest lay with the comparative anatomy of the Vertebrata, a field to which he made significant contributions. An important account, which Howes co-authored with H. H. Swinnerton, dealt with the development of the skeleton of the Norfolk Island reptile, the Tuatara or Sphenodon. The Revd. T.R.R.Stebbing F.R.S. (1835-1926), Fellow of King’s College, London.